Students have 2 hours a week of PE at Key Stage 3, and 2 hours per week at Key Stage 4. Students also have the opportunity to choose GCSE PE at Key Stage 4. They cover practical and theoretical elements within the course with 30% being based on physical performance in 3 sports, and 70% based on 2 exams and a Personal Exercise programme. Physical Education gives students an understanding of fitness and health, and safe exercise. We challenge the students to show fine skills and their correct application. It provides competition, teamwork, and communication skills as well as building self-esteem and confidence. We also strive to offer as many extra-curricular opportunities as we can as it allows students to practise the skills previously learnt in lesson. It gets them ready for inter and intra-school competitions, promoting their independent learning skills as well as their leadership and coaching skills. It promotes a pride for their school, and encourages support for each other. Students learn rules and basic skills and how to put these skills into a game in Year 7. As they move into Year 8 and 9 we look at tactics, positioning, how to spot weaknesses in the opposition and how to maximise personal strengths. There is an emphasis on health and well-being and the positives this brings to a healthy lifestyle. Students have the opportunity to learn leadership skills by coaching, officiating and scoring. A focus on healthy competition and sportsmanship, learning to win and lose well sets the students up for more independent learning at Key Stage 4. There is a greater emphasis at Key Stage 4 on independent learning and preparing students for lifelong participation in physical activity. In Year 10 lessons are based around leadership, students putting their coaching skills to the test, being able to referee, listening to their peers, preparing well for physical activity by doing their own warm ups, and being able to play games or matches without the influence of a teacher making decisions. In Year 11 students are given a choice of what activity they would like to do. This helps us promote healthy active lifestyles. Students have the responsibility of setting up their own equipment, refereeing themselves, organising games in lessons, sorting themselves into fair teams (without using the old fashioned “picking teams” method), setting themselves targets in swimming and health related fitness lessons, thus enabling us to prepare them to be responsible and active citizens once they leave school. Cardiovascular system respiratory system, muscular system, and skeletal system. The immediate and long term effects of exercise and the effects of lifestyle on the systems, data analysis. Levers, and plane and axes and their role in physical activity, data analysis. Fitness tests, components of fitness, methods of training, principles of training, warm ups, cool downs, injuries and injury prevention, performance enhancing drugs, data analysis. What is health, benefits of exercise, lifestyle choices, sedentary lifestyle, diet, data analysis. Classification of skill, Target setting and SMART targets, guidance and feedback, mental preparation, data analysis. Different social groups and sport, Commercialisation in sport, ethical and socio-cultural issues in sport, data analysis. Students have to be assessed in 3 sports – one team, one individual and a choice of a team or individual. The sports that students can take part in are set by the exam board. Each sport is marked out of 35. 10 marks for skills in isolation and 25 for a competitive situation. Each sport is worth 10% of the final grade. Students will do at least 8 different sports in school, as well as the possibility of being assessed in the sports that they may do outside school eg horse riding. The best 3 marks will be put forward to the exam board. Students plan, design and carry out an exercise and fitness programme over 6 weeks. They then need to evaluate how successful their programme was, and what evidence there was of their fitness changing. Core PE – students are assessed on their attitude to learning as well as their ability to acquire and develop specific skills, select and apply appropriate skills, their knowledge and understanding of the sport, evaluate and improve their own and others’ work, and understand the benefits of fitness and health. GCSE PE – Students are given formal assessments at the end of each topic, which are monitored and tracked as well as mock exams in Year 10 and Year 11. Core PE – Homework for core PE is to practice the skills learnt in lesson, and try to apply these to a game situations. Join a school club or local sporting club to practice the skills learnt. Take heart rates at rest and during exercise and understand the target zone they need to be in to improve fitness. GCSE PE – Homework is given at least once a week for GCSE PE will be related to the current topic being covered. The PE department offers a wide range of extra-curricular activities including an extensive inter-house competition. The sports hall is available for different Key Stages at lunch times, offering different sports each term, run by the school’s student Sports Leaders. The swimming pool is available during certain lunch times, and there is a running club throughout the year. 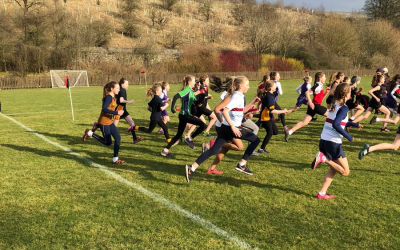 The school has teams in many sports and regularly plays competitive matches with other schools, as well as taking a full part in the inter-schools cross country competition.